When I studied abroad in Cusco, Peru in the summer of 2017, I took a class titled ‘Indigenous Knowledge and Climate Change Adaptation in the Peruvian Andes’. 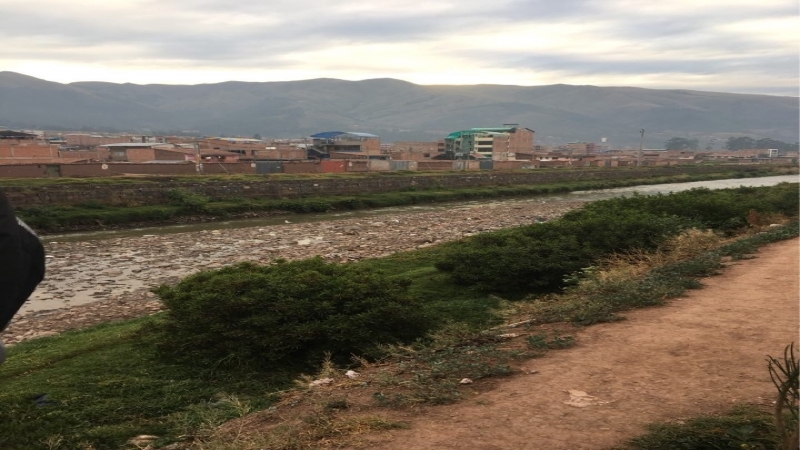 The professor of the class, wanting to give us an up-close example of the environmental degradation in the area, took us on a field trip to Rio Huatanay, a severely polluted river in the district of San Jerónimo in Cusco. When our 8-person class took a rocky bus ride through the cobblestone streets of Cusco, the landscape quickly transformed into one a bit different than we were used to. As we neared the edge of Marcavalle, the cozy district of the city that we had begun to call home, the streets filled with trash, and the stray dogs soon outnumbered the people. After about thirty minutes, the professor guided us off the crowded bus and across the street to a nearby residential area. We made our way across a bridge and the Rio Huatanay came into sight. From what we could see from a distance, the river was completely trashed, full of garbage and sewage that had accumulated over the years. Fortunately, the professor had scheduled the field trip bright and early, at 6:00 am—so that we would not have to deal with the smell that arises from the river come sunrise. We made our way around groups of mangled dogs eating garbage and sipping the toxic water as our professor spoke to us about the history of the river, once a source of life and prosperity dating back to the time of the Incas. In recent decades, he explained, as the population grew in the city of Cusco, the infrastructure for trash and sewage was unable to keep up, and so the people began to direct all of their waste directly into the Huatanay, which eventually ends up in the Amazon River. It is estimated that over 135 tons of solid waste are produced by the city of Cusco each day, with a majority flowing directly into the Huatanay River (Congreso de Peru 2013). The Huatanay itself is now a ‘dead zone’, with no fish or organisms surviving the pollution. When I was able to get a closer look, I quickly realized that among the garbage scattered throughout the river were the floating corpses of stray dogs. The class continued to walk until the professor stopped us and pointed out a pipe that appeared to be pouring a red liquid into the water, with dogs surrounding it and drinking from the liquid. He then pointed to a building directly above this pipe. “This is the slaughterhouse,” he said. Through this pipe, he explained, the slaughterhouse sends a constant flow of blood, meat pieces, and cleaning chemicals directly into the river. Horrified, we continued along the edge of the river, stepping around the reeds that had the paws of dead dogs protruding out. The professor explained as we walked that many of the people and farmers in the area continue to use the water to feed their cattle and water their crops, unaware of the detrimental effects to their health. An image of the garbage in the Huatanay River. To the left, you can see that the water is red and discolored with blood from the nearby slaughterhouse. Photo taken by my classmate, Allie Callanan. After walking and talking for a bit, the professor stopped us again and pointed back at the slaughterhouse now that we had a better view. “What does it say on the building?” he asked us. The slaughterhouse proudly had the words Municipalidad de Cusco plastered on the side. “It’s a government-owned slaughterhouse," he said grimly. The professor guided us further along, walking us through mounds of toxic waste that had been left from nearby construction projects. He spoke more about his personal efforts to clean up the river, taking university classes to pick up trash, or speaking directly to government workers from the slaughterhouse. This is an image of the toxic waste that has been dumped in and around the Huatanay from nearby construction projects. Picture taken by my classmate, Allie Callanan. As we neared the end of our tour, the professor showed us the outside of a solid waste treatment plant. This plant was part of a plan approved in 2012 to clean up the Huatanay River, costing around 370 million soles (~143 million USD). However, this plant only has the capacity to treat a small fraction of the actual waste being deposited into the river on a daily basis. Once the wastewater is treated, the professor explained that it is simply then re-deposited upstream to be re-polluted. This project was just one of many, most of which were started and then unfinished, to treat this water and improve the health of the river. The careless dumping of waste and garbage into the Huatanay River has detrimental effects on the surrounding community, many of which the contributors may not be entirely aware of--shown through the dialogue that our professor had with the slaughterhouse worker. First, because of the severe pollution coming directly from the city of Cusco, the communities that once relied on the river’s health for a source of food, water, and agriculture are now suffering. And, what is worse, many of these people have not been educated on how the river’s poor health can affect them if they continue to use it. So, some local farmers continue to use the contaminated water to feed their animals and to water their plants, posing a health risk to anyone who consumes the food that comes from it. Additionally, in the event of heavy rains, which are increasingly unpredictable as a result of El Niño weather events, the river quickly floods and poses a direct health threat to the surrounding communities. Second, the Rio Huatanay indirectly flows into the Amazon River, the second longest river in the world, and undeniably one of the most critical water sources in South America. Therefore, anything that flows from the Huatanay—be that human sewage, garbage, toxic waste, or chemicals—ends up in the Amazon, threatening the health and livelihoods of everyone who lives or relies on the river's water. Finally, the clearest and most obvious effect of the pollution of the Huatanay is the inability for wildlife to survive in or around it, which I saw firsthand. The river’s ‘dead zone’ status means that, because of the severe pollution, there is limited oxygen in the water and it is impossible for anything to grow in or around it. As a result, this river, a thriving source of wildlife ever since the 14th century, cannot sustain any more life and severely threatens the health of any animal that drinks from it. When it comes down to it, the Huatanay River’s catastrophic state is the result of rapid population growth, and the city’s subsequent inability to keep up in terms of infrastructure and basic waste services. According to a recent census, the population of the city of Cusco grew by nearly 56% between 1981 and 2015. In the district of San Jerónimo, the one that we visited as a class, the population increased by 50% from 23,584 to 47,000 between 2000 and 2015 (Population City 2017). As a result of increasing fertility rates and rapidly declining mortality rates since the 1960s, the population of Cusco has boomed, and the infrastructure of the province has proven insufficient for such a large population. In Cusco, as in much of Latin America, the existing sewage systems are old and poorly constructed, resulting in regular breakage and overflowing. In the short time that I was in Cusco, there were several instances when, following just a light rain, pipes would burst and the streets would flood with sewage. In addition to the poor quality of the sewage system itself, the existing wastewater treatment plants are simply not enough to sustain the waste of the city’s large population. As mentioned earlier, a new wastewater treatment plant was recently constructed as a part of a greater effort to clean up the Huatanay; however, this plant still only has the capacity to process a small fraction of the waste produced by the city, causing the rest of it to be dumped directly into the river. It is unlikely that the population of Cusco is going to stop growing any time soon—therefore, the waste produced is only going to increase, and the pollution of the Huatanay is only going to become more severe unless the government actually works to improve its infrastructure and services to support its constituents. The key to cleaning up the river is a combination of education on why the river needs to be saved and on how each individual can stop contributing to the problem, and an increased amount of funds allocated to the construction of improved sewage, garbage, and wastewater treatment infrastructure. While a serious case in itself, the Huatanay is only one example of hundreds of severe cases of water pollution throughout South America, and many more throughout the world. However, given the high stakes and an apparent desire to change (which can be seen through the recent efforts, however unsuccessful, to clean up the river), I believe that this river is not a lost cause, and that it is not necessarily too late to be saved. Through the reallocation of local and federal government funds, and a legitimate effort to increase the community's understanding of the gravity of the problem, the government and the people can reduce the Rio Huatanay’s severe contamination--and can even eventually even bring it back to life.